With the fury over Destiny still in full swing (Rob and Brad are addicted) I decided to take to the interwebs and look into a great way to incorporate my PS Vita and allow the wife to still watch what she wants! So naturally, I decided to give Remote Play a go and honestly I’ve had mixed results. I fully expected for the setup to be easy, and for the most part following onscreen prompts for the Vita and the PS4 are fairly self-explanatory and anyone should be able to make it work. Connecting it to my PS4 was a cinch! Getting Remote Play to stay connected however…not so much. I had a terrible time getting the connection to stick. At first, I tried the Direct Connect option. This is where the PS4 basically acts as a wifi hotspot and (with limited range) can offer a cool setup…but it was always unreliable for me. I have 30M up and 5M down so I figured I’d be in really good shape. Downstairs not so much as the signal from the router was apparently good enough for the console but not good enough when connected via Remote Play. Many folks have theories as to how to make this better. Turn on QoS…setup Static IP…DMZ…OMG! Who has time for that crap! In the 21st century things should just frankly work. I tried a few different configurations, and honestly…I have it working OK. If I am close enough to the Router and the signal is strong I can play for extended periods with occasional lag but it’s manageable. 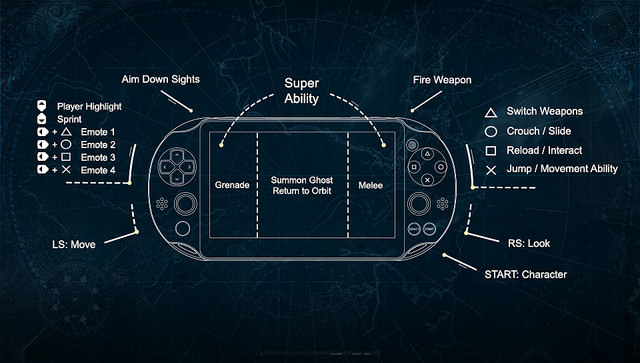 Conveniently Bungie gave us some controls for Vita. They are actually pretty decent, but it’s not something I would use to play the core game, go on Strike’s with, etc. Go do a few Public Events, go on Patrol missions or hit up the Loot Cave and it is perfect. Sony could actually take a play from Nintendo’s playbook. While the Wii U does have it’s short comings, the connection and lag issue between console and controller/gamepad is seamless and hardly noticeable with NO setup at all. Literally. None. Sony added the Remote Play feature in the PS3 generation as an afterthought with serious limitations. PS4 has tried to capitalize on things, but unless your internet is screaming and you are some kind of wireless router guru, things can get sticky pretty quickly. From my perspective, I think Remote Play has a place and apparently is VERY popular with Destiny players. For this gamer, I’ll use it casually and play the real game on my big screen…sorry hunny!